After recent, high profile school shootings, the debate of whether citizens have the right to bear specific types of arms is in question, with the focus on everything from mental health to the Second Amendment. Recent tragedies striking our nation, including the Dec. 14 Sandy Hook Elementary School shooting, has made gun control a hot issue across the nation and in our local community. In response, President Barack Obama has proposed a 23-point gun control plan to implement change. But how will it impact the Stockton community and Delta College students? Many students may feel unaffected by these issues, but in reality gun control concerns are closer to home then we think. With the Cleveland School massacre taking place in Stockton just 24 years ago and with all the current incidents occurring due to gunfire, students may be left feeling uneasy about campus safety. “I don’t want my students to come to class scared. I want them to be confident and know what to do in every situation,” said Mary Blackford an English instructor on campus. Blackford was one of the instructors who, on the urging of campus police, lectured on different “active shooter” scenarios at the beginning of the semester. She explained to her classes what to do and where to go if such a situation happened here. Blackford has taken self-defense training courses and knows two forms of martial arts. She is trained and certified to shoot a firearm. Campus police, in light of the Sandy Hook shooting, implored instructors to show a video entitled “Run, Hide, Fight” to students. The viral video is being shown across the country in classrooms. Delta College is one of only a few community college campuses to have its own police department, a rare commodity. “Delta College has had very few firearm related issues and is the safest public location in the City of Stockton. This track record of safety is directly attributed to the laws that are in place and the active police presence on the campus. Per state law, carrying a firearm on a community college campus is illegal,” Delta Officer Jim Bock said. Blackford said the police presence is a definite safety plus. “Having an armed police force on campus helps alleviate many of these scenarios from happening on campus,” Blackford stated. 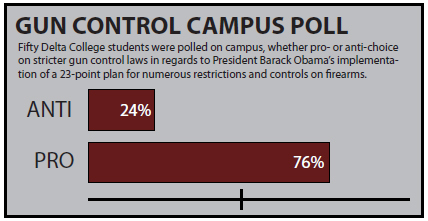 The opinions on gun control laws differ throughout campus. “When guns are outlawed, outlaws will have guns,” said Blackford. That means guns can and will fall in the wrong person’s hands. Blackford stresses the importance of mental health programs and expanded background checks. Dr. Manuel Roman is an adjunct professor for Delta College teaching sociology, criminal justice, and criminology. He has done extensive research on the topic. “To somewhat quote Obama, if we have some type of gun-control plan and save any life, one life it is worth it, no life is expendable we have to do something,” said Roman. Roman said there should be no need for sale of automatic weapons at gun shows or in shops. Automatic guns are primarily used by the military, a held trigger allows for 45 rounds to be shot per minute. He also heavily believes, like Blackford, mental health programs and training are necessary actions. “With the gun control action in force anyone that has gone to counseling would be put into system and flagged when trying to purchase a gun,” said Roman. Roman tries to give his students some type of background on scenarios and reassures his students. “I tell them don’t worry should something happen I am prepared to do anything and everything possible to keep us safe,” he said. Bock and the Delta Police force work hard at trying to make students aware of their surroundings. The “Run, Hide, Fight” videos have gone viral around the nation and are encouraged to be watched by the department. The genuine concern of all Delta staff members seems to be of the upmost concern for the students. The gun control issue is a serious matter, and will affect us as students if the plan is implemented or not. “These are the things that are big issues in every community, and has to be thought of in every community,” said Roman.